InterMine was formed in 2002 at the University of Cambridge, originally as a Drosophila-dedicated resource, before expanding to become organism-agnostic, enabling a large range of organisations around the world to create their own InterMines. The InterMine team is part of Micklem lab, headed by Gos Micklem. InterMine’s core team members are all based in Cambridge and are generally available during UK daytime hours. InterMine is part of the Micklem Lab, led by Gos Micklem. Gos is also director of the Cambridge Computational Biology Institute. Gos can often be found writing grants and winning Department of Genetics awards for enthusiastic lecturing. (He says that this was probably a statistical anomaly). Julie joined the InterMine team immediately after graduating with a Computer Science (hons) degree from Bristol University in 2006. She specialises in the InterMine build system and writing meeting agendas. Computer Scientist with a M.Sc. in Data Science & Machine Learning. His interests span from Machine Learning applied to cancer bioinformatics to the handling of biomedical big data. Previously, Adrián has worked in a variety of places in both the private and public sectors, such as the Spanish National Supercomputing Center and the Spanish Council for Scientific Research. He also has participated as Google Summer of Code student with InterMine in 2018. When he has some spare time, he loves to play chess. Software Engineer with 15+ years of experience in web applications development in a variety of industries. Experienced in J2EE open source frameworks, servers, libraries and web services. 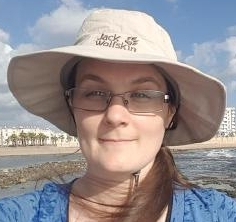 She joined the InterMine team in 2010, working for 3 years, primarily in the backend development, then she moved away to the game industry but she changed ideas very soon and came back thinking that genes and proteins are more fun than treasures and crowns! She doesn't tweet, but sometimes, when forced, she posts on InterMine's blog. Biologist/bioinformatician with over 10 years experience working with InterMine and complex biological data, she forms the liaison between the biology and the software development. Rachel also runs training workshops for InterMine users and provides help-desk support. With InterMine since 2007, has worked mostly in the production of modMine (modENCODE project) and ThaleMine (Araport project). Likes databases and data visualization, has produced a music album of his compositions. Previously, Yo worked at Capital One and K-Now, a spin-off from the University of Sheffield. In her spare time you can find her running, cycling, or reading speculative fiction.